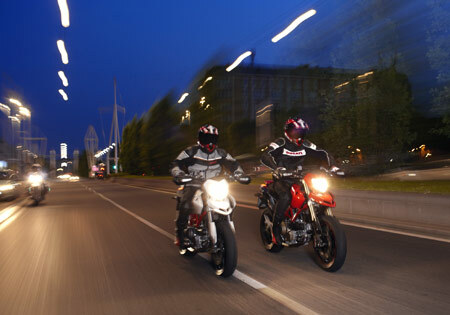 Riding a motorcycle after dark can be anything from a sub-par and dangerous experience to one that is an enjoyable and equally safe alternative to daytime riding. A number of factors affect where you will find yourself on this scale, and fortunately most are in your control. 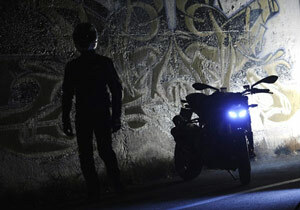 As it is, some riders avoid the night because unless extra steps are taken, it is usually harder to see and be seen. What’s more, in many regions splattering bugs can be an issue, as can deer or other nocturnal animals. And if you crash in the middle of nowhere, well, that could be a bad scenario, no doubt. But this said, many commuters wind up riding in the dark of the early morning or after the sun has gone down, or both. And many others may finish a day of riding after sundown. So, if you expect to ride in the dark, you’d be well advised to assess your equipment and decide whether it is really all you need it to be. And even once you are satisfied with your setup, you will still want to ride within limits. One old adage is “do not over-ride your headlights.” You can only see what they illuminate, and if you cannot bring the bike to a safe stop within the range of your window into the darkness, you are asking for trouble. While this article is not meant to be comprehensive, it will highlight some practical suggestions. Making sure you are ready for night riding could one day save your life. Assuming your eyesight is OK, the rest of the equation is determining how up to the task your lights are. Some touring bikes may be pretty well endowed with lighting. On the other hand, some sportbikes and others may be just so-so. This is a judgment call based on your skill, vision, and risk tolerance, but a lot of stock bikes could stand a headlight upgrade. Is yours one of them? 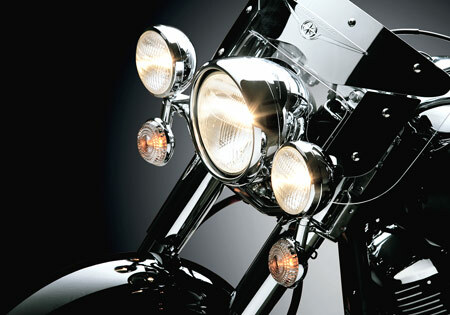 Different motorcycles feature a variety of lighting options. Headlights perform a few functions: “low beams” offer wider, shorter-range beam patterns with a “cutoff” in the height of the pattern so as not to blind other drivers. Driving lights or “high beams” offer longer, generally narrower-angled beam patterns meant to throw as much light down the road as possible. White-colored fog lights are really just another form of low beam with a sharp cutoff so the light does not reflect back in your face and blind you. According to Gordon Robertson, VP of powersports lighting for PIAA Corporation USA, the main reason fog lights were once commonly amber colored is because manufacturers did not have good control of the lens design, and amber offered less obnoxious reflection off of the oncoming haze. Today the aftermarket is replete with lighting choices. You can upgrade your existing bulbs with brighter, but same wattage replacements, and you can try to upgrade the wattage or type of bulb too. If upgrading bulbs, you want to be sure not to melt your wiring, switch housing, plastic headlight bezel, or over-tax your alternator, so do your homework. 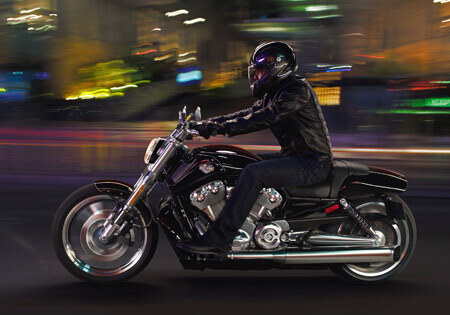 Take an objective look at how visible your motorcycle is in dark lighting conditions. Nor do you want to be obnoxious to others. Running super-bright high beams is OK for back roads, but around town, auxiliary lights or even white fog lights that approximate a low beam are the way to go. Assuming your electrical system can handle the draw, you can increase both low and high output and not blind others. Helping you pick your best solution is beyond the scope of this article, but you can be sure if you do it right, you can easily double your output or more over stock. If your aesthetic tastes or your bank balance object to upgraded lights mounted on your bike, well that’s another matter, but you may otherwise want to consider it. Some have found extra lighting opens up a whole new world they never knew was on the other side of sundown. You see the whole gamut out there. Some riders load up their bikes with LEDs, extra running lights, neon kits, and reflectivity. Others – like some sport riders – opt for under tail kits, and downsizing their turn signals/front running lights that, while looking more “racer,” can make it all the more difficult to be seen. If you want to be objective, one dark night you should park your bike somewhere with the lights on, and stand off at a distance to assess how visible it really is from the front, back and side. While you are at it, shine a light on it to see how reflective it is. Now imagine how well a car driver who is sleepy, fatigued, stressed, drunk – or all of the above – will be able to see you. Or imagine they are texting at night, and you are cruising on your two-wheeled, dimly lit rocket. It’s your call, but this is a word to the wise. Another advantage of dual or auxiliary headlights is you are more likely to be identified sooner as a motorcycle, rather than a car at a distance, or with one headlight out. Reflective bits placed strategically can also help a lot. Reflective tapes come in a variety of colors that may nearly match spots on some bikes to be less conspicuous in the daytime. Or if you are really against covering your bike with tape swatches, there are reflective decals that look like flames, or other designs. Or you could carefully cut some reflective tape and discretely place it in a way that does not call attention to itself in the daytime, but will still do the job at night. Black bikes and dark riding gear may look cool but they make it harder to be seen by other motorists. Some of the best reflectivity comes from tapes meeting specifications set by the International Convention for the Safety of Life at Sea (SOLAS). There are two types of design in the SOLAS world: prismatic and glass beaded. Both have their advantages, and both are available in colors from different vendors. The glass-bead type is about 1/3 as reflective as the prismatic type. Also, bear in mind that the DOT specifies the color red for the rear of a vehicle, amber for the side, and white for the front. Keeping the reflectivity colors to spec may help others know if you are coming or going. And aside from your bike, the same goes for your clothing and helmet. You want to be easily identifiable as a person when riding. And if you fell and were injured on a dark road, you would want to be visible well before another motorist could run over you. Always wear clear, clean, unscratched eye protection at night, and understand that even with up-rated headlights, details of the road’s surface may escape you. Carrying a small non-abrasive microfiber cloth and water or safe solvent to clean your face shield is advisable. And bringing an extra layer or other suitable clothing for nippy evening temperatures is likewise recommended. Odds are that you are sharing the roads not just with nocturnal creatures, but one of the most dangerous animals there is: the inattentive driver. As bad as some are in the daytime, at night they are statistically more likely to make mistakes, so do not let them tailgate you. Give yourself plenty of space too. And if you are tired as well, don’t underestimate it. Being fatigued or stressed can make you as disadvantaged as someone with alcohol in his system. But aside from being aware of possible pitfalls, with enough rest and preparation, riding at night can be a great contrast to daytime riding. In the summer it can be comfortably cooler and possibly less crowded. Everything looks different and you may see sights you’ll never see in the daylight. Whatever you do, don’t just leave it all up to your luck. If you realistically anticipate conditions, you will have a better, safer ride.